This month, for our Reading Wildly staff reader's advisory training, we discussed series fiction books. We decided to tackle this topic because kids are asking for these books all the time and we realized that there were many that none of us had read. We challenged ourselves to choose books in the popular series that are frequently requested at our library. To jump-start our discussion, we all read the article "Not the Newbery: Books That Make Readers" by Betty Carter (The Horn Book Magazine, July/August 2010). In this article, Carter talks about the importance of books that are popular with kids but might never win literary awards. Reading books that they enjoy is a leisure activity for kids, "one that requires them to move their eyes across print and thus strengthen their basic skills" (p53). And reading what their friends are reading helps create a "community of readers", kids reading and talking about the same books. I know when I was in middle school my group of friends was crazy about Goosebumps and we all wanted to read them to talk to our friends about them. 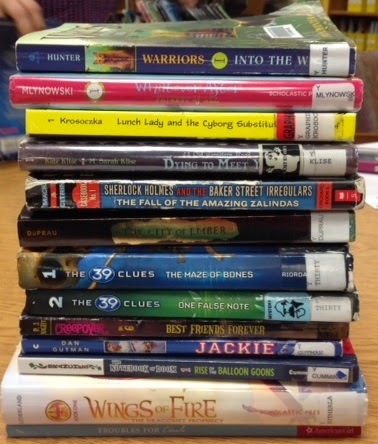 Valuing what kids like to read helps librarians create a connection with kids and it helps kids see that they are valued members of our library and of our community. And if we don't read some of the books ourselves, how will we talk with kids about them?! It was great to get a little booktalk and learn a little bit about a bunch of different series at our discussion. A lot of these series are quite popular with our kids; they're definitely creating communities of readers! Next month, our topic is sports. Although I know that boys AND girls can and do read about sports, the article I chose to go with our discussion is a chapter from Serving Boys Through Readers' Advisory by Michael Sullivan. We are reading the chapter called "Booktalking for Boys". What are some of your favorite sports books for kids?